At last, it’s release day for Tillie and Greg! Still not sure if you can trust me to deliver a compelling read in my new mainstream Contemporary Romance series? Well, about a week ago, suffering pre-release jitters, as usual, I asked a long-time reader to give it the once-over, and Angelique Luzader shared this in some of my Facebook groups. I consider it the first review! “This book is AMAZING, and I can’t wait to hear what you all think! I was so honored last week when Kallypso Masters came to me and asked me if I would be willing and able to read through this book for her to catch any last details. I’ve had a million things on my plate and I honestly needed an escape, so I dove in. I was nervous, I LOVE Kallypso’s Rescue Me series and didn’t know how I would feel about this new, more contemporary series starter. Could it still draw me in as her Rescue Me series has, would it be a series I could invest in… The answer is a resounding yes! Kallypso has included so many of the elements I have come to expect from her books in this one! This novel will introduce you to real life characters who are facing real life issues along with a couple of meddling (yet totally lovable) spirits who just want what we all want for Greg and Tillie, the happily ever after that they both deserve! As always, I’ve poured my heart and soul into this story–perhaps even more so because it’s set in my home state and I’ve included lots of my favorite places, some of my own family lore, and 16 to-die-for family recipes for dishes mentioned in the story. If you’re looking for a light escape, but one that still has a powerful story to tell, I hope you’ll give Jesse’s Hideout a try! Then please tell ALL your friends and family. This one is a safe one to share! And who can’t resist getting to know the legendary Jesse James when his spirit shows up right in the Prologue? I let my imagination run wild with him, but ever since my dad told us ol’ Jesse James used to hide out in the house pictured on the cover, I’ve felt like Jesse James is a part of my family, too! Reviews are greatly appreciated, including at Goodreads and wherever you purchased your copy! 1. If you haven’t already done so, purchase your e-book copy of Jesse’s Hideout no later than Monday, April 3! 2. Take a screenshot or photo of the first page of CHAPTER TWENTY-ONE. 11:59 p.m. EDT (New York City Time) on Monday, April 3. Winner will receive a $50 Bookseller Gift Card, but please watch for the email from my assistant Charlotte Oliver (charlotte@kallypsomasters.com) on Tuesday April 4. You will need to confirm with that e-mail, then we’ll announce the winner (however you’d like to be named) via my Facebook Author Page, website, and in the next newsletter. Good luck! Only ONE entry per person, if you submit more than once only your first entry will count. We had so much fun a couple of years ago with the Rescue Me Saga Cook-Off that it only seemed natural to do it again with Jesse’s Hideout! Tillie loves to cook and bake for the guests at her Bed & Breakfast—interestingly enough, many of my family favorites—so I have included 16 recipes in the back of the book. 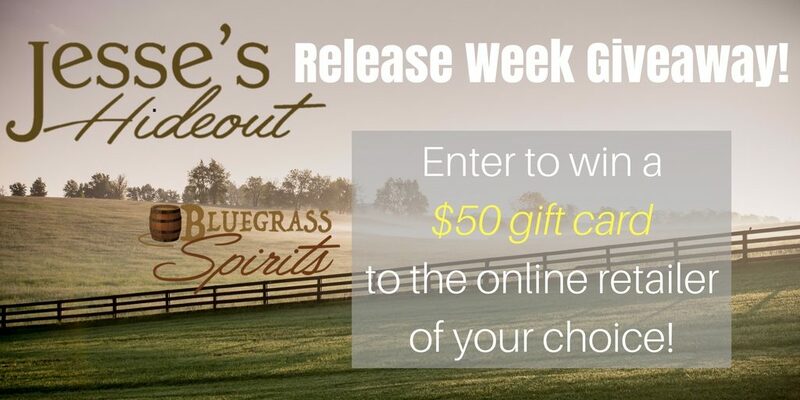 Try your hand at ANY ONE of them to enter to win a fantastic gift basket FULL of Kentucky goodies and other treasures! Contest runs from today until 11:59 p.m. EDT on April 30, winner will be contacted via email from Charlotte Oliver (charlotte@kallypsomasters.com) on May 1. How to Enter:1. 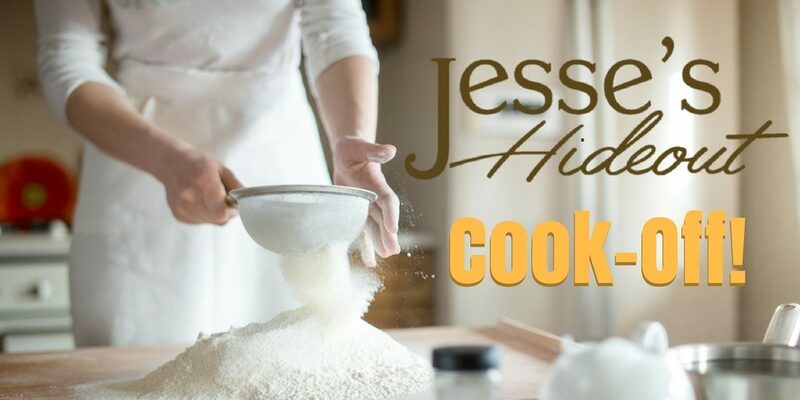 Choose one recipe from the back matter of Jesse’s Hideout to cook/make/bake and prepare it! 2. Snap a photo of the finished dish WITH YOUR E-READER OPEN TO THE COVER OR TITLE PAGE OF JESSE’S HIDEOUT NEXT TO IT! 3. Fill out this form and upload your photo. ← ROAR on Sale for First Time Ever!